Psychology Camp 2015: Committee Recruitment! Psych Camp 2015 is happening this summer and we are recruiting! Yay! Psych Camp is not just for people who intend to major/are majoring in psychology, it’s for anyone who is down for some good ol’ fun and making new friends! The Management Committee is currently looking for individuals who like planning for a camp, want to have fun in a group and more importantly, wants to provide freshies with an experience that they will not forget! If you belong to any of these categories, sign up now! With 2015 marking the 10th year since the introduction of Motivational Interviewing (MI) in Singapore, Shan You Counselling Centre (SYCC) will be hosting the Asia-Pacific Symposium on Motivational Interviewing (APSMI-SG) on 5th and 6th February 2015 at Concorde Hotel Singapore. This international event aims to provide local and overseas professionals with current research information on MI and offer interactive presentations, discussions and professional skill building workshops. To sign up as a volunteer, please go to this link http://goo.gl/forms/obS4GBu1Z4 and complete the form by 10th January 2015, Monday. Kindly note that priority will be given to volunteers who are able to commit for at least 1 full event-day. For enquiries or further information, you may contact Ms Lim Shu Mei at shanyou@shanyou.org.sg or call 6741 9293. NUS Psychology’s Society’s Annual General Meeting has concluded on 4th September 2014 and we are proud to introduce to you the 9th Executive Committee who will be serving you in this academic year of 2014/2015. Psychology Society is a student-led body that strives to promote the welfare of our members. We also hope to allow interested parties to better know the field of psychology. We organise a variety of events throughout the year to look after members’ academic and non-academic needs. We have Psychology Appreciation Week which includes welfare pack distribution and Wear-Your-Psych-Shirt Day! In addition there are also academic tours and talks available. This year we hope to bring the freshmen a revitalised Psychology-Camp so stay tuned! Apart from carrying on with established events, the 9th Executive Committee welcomes feedback and suggestions from members to adapt and streamline our existing events to better cater to our members’ needs. NUS Psychology Society also intends serve as a bridge between Psychology majors, alumnus and the Psychology Department so as to foster a cohesive community amongst them. As such, we would hope to see all of you at our events, so that we can get to know each other better. In this new academic year, we also strive to further engage both our current and senior members by offering more bonding opportunities through hosting more gatherings. Through this, we hope to allow all our members, be it those who are currently studying or those that have graduated, to interact with each other and share valuable experiences. In addition, we also hope that these gatherings would be platforms where the 9th executive committee and the members can get to better know each other. 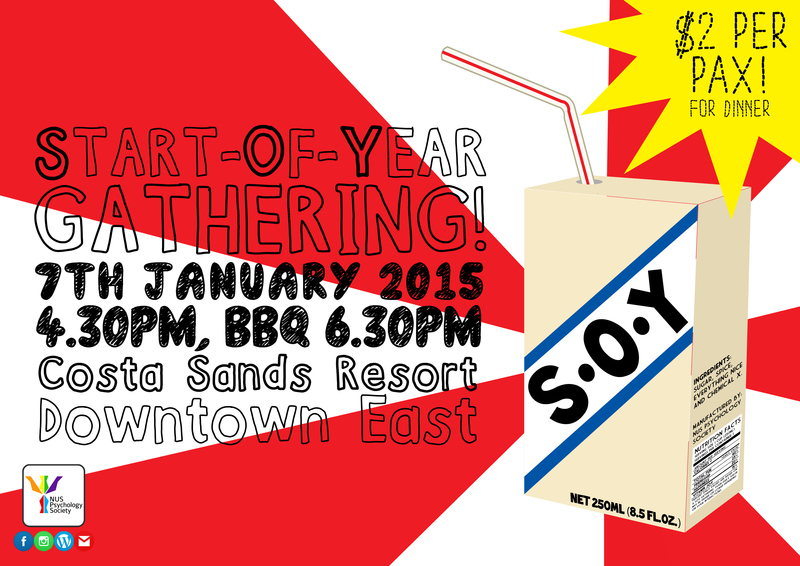 Look out for the gatherings during the holidays! For those interested in planning for our activities, we would be recruiting sub-committees for Psychology Camp from December 2014 to February 2015. Members are also welcome to volunteer at our events or with organisations such as the National Kidney Foundation and the Institute of Mental Health. We hope that it will be a meaningful journey and experience for all of us! Please continue to support us this new academic year. Let us know your interest in contributing or offer us your valuable feedback and suggestions by sending an email to nuspsyche@gmail.com. Alternatively you can approach any of the friendly committee members in school. We wish you all the best in this academic year! Planning to start your own business in sales? Got some loots you want to sell? Now’s your chance to participate in our annual Bazaar as a vendor! For further details, please look forward to a confirmation email that will be sent to all successful vendors closer to the event date. Please contact Ivana (treasurer@nuspsyche.org, 8113 2813) if you have any queries. Interested? 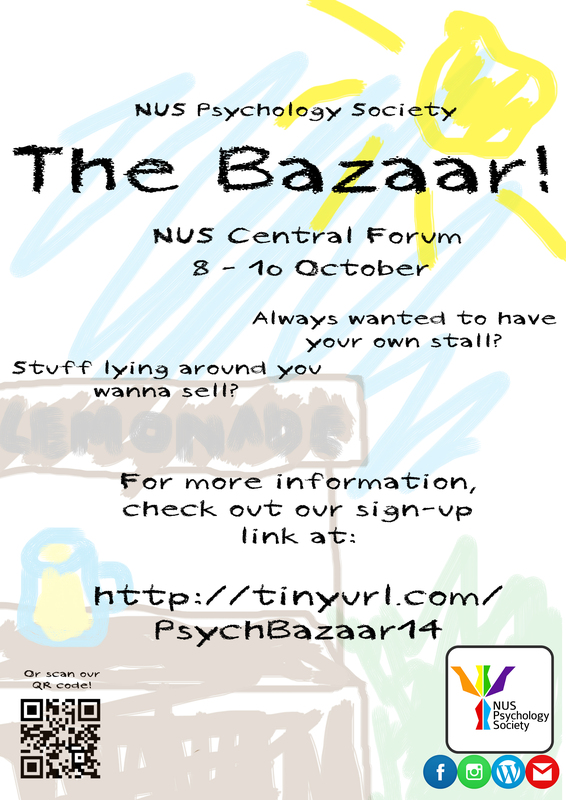 Sign up at this link: http://tinyurl.com/PsychBazaar14! Application will close either on 24 September (Wednesday) 6PM or once all slots have been taken up!